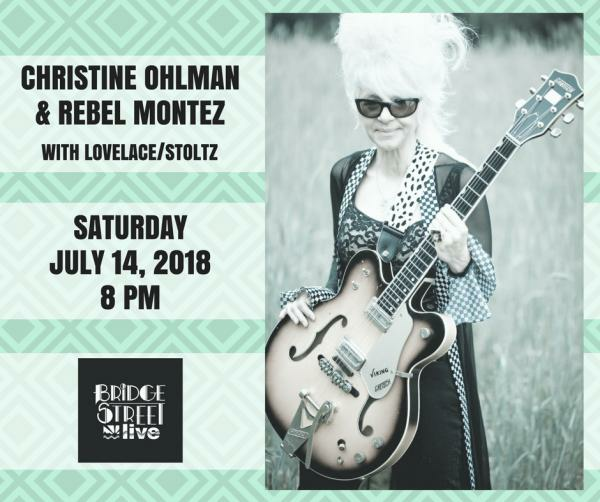 SNL rocker and Bridge Street favorite CHRISTINE OHLMAN returns with her band REBEL MONTEZ, and openers LOVELACE/STOLTZ, on Saturday, July 14th at 8 pm! CHRISTINE OHLMAN, queen of blue-eyed rock n’ soul, grew up loving both the sweetness of a Memphis horn line and the raunch of an electric guitar riff, teased her blonde hair into a beehive (in honor of Ronnie Spector) and never looked back, picking up a guitar and forging a career as a songwriter in the process. Ohlman tours relentlessly, torching clubs up and down the Eastern Seaboard with her band Rebel Montez (featuring Michael Colbath on bass, Cliff Goodwin on guitar, and Larry Donahue on drums). She is the current, long-time vocalist with the Saturday Night Live Band, and was featured with the B-52’s during the recent SNL 40th Anniversary post-show concert. With her trademark, mile-high, platinum beehive hairdo, and an enviable collection of sequins and rhinestones, Ohlman looks like a lady to be reckoned with, and when she opens her mouth to sing, the truth comes out. But underneath it all lurks a no-frills approach to music. In her own words: “I give it to an audience straight, which is the way I like it myself. Yes, I like to shout, and I like to croon, and I love to wail. I just need to get in the groove and rock—not think too much about it—tear it up or soothe it over. I’ve loved rock n’ roll since I was a little girl, and I’ll love it forever. It’s my greatest kick, and my greatest privilege, to be able to get up on a stage and rip it apart. That’s rock n’ roll to me. I’m here to set your soul on fire.” And set your soul on fire she most certainly will! Opening the show is Americana duo Lee-Ann Lovelace and Dave Stoltz.